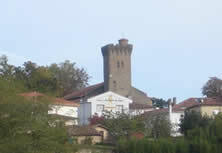 It's in Montaut, a typical vilage located in the Landes area, stood at the foot of the Chalosse hills in the South West of France, that Lafitte family, for 4 generations, protects and perpetuates with passion, the traditions and the know how of the Landes gastronomy : a rich heritage of flavours, original recipes and unique dexterity ! At the very beginning, the founder Pierre Lafitte used to sell game products, goose and duck foie gras to restaurants from south west. 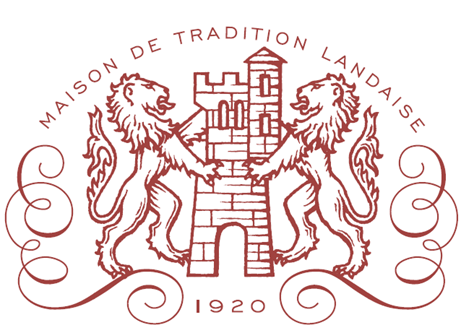 Since then, the company still family-owned has grown up and presents a full range of prepared products but the spirit is still the same : propose the better traditionnal duck from the Landes to its customers. Lafitte distributes its regularly awarded and certified products in France to famous restaurants, delicatessen and in the 6 stores owned by the company (Montaut, Paris, Mont-de-Marsan, Dax, Bayonne and Bordeaux). 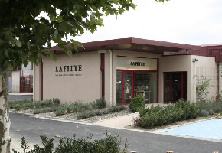 Synonym of excellence and authenticity, Lafitte exports also its products in Europe and worldwide. Discover where. Our ducks for foie gras are from an old origin with a slow growth, recognizable by their white and black coloration. An absolute sign of quality. Lafitte works with more than 80 breeders and perpetuates the traditional breeding in a local and measured agriculture with small farms. Our ducks are bred in the Landes area, free range in an open air and natural environment. Our ducks are bred only with vegetal products (corn, wheat,...) and fed traditionally with whole corn of maize in park (this production represents less than 5% of the French production). Our production specifications guarantee non GMO food (corn, wheat and soja). 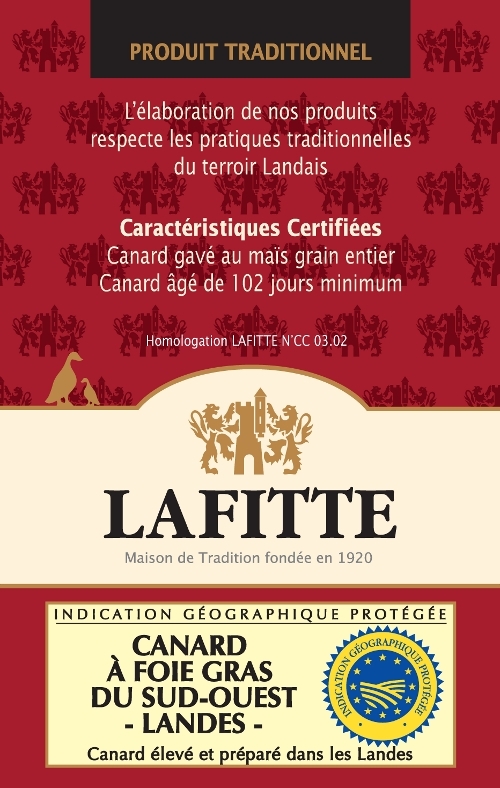 Since 2002, Lafitte works with its own certification of breeding and production specifications that garantees its customers a traditional duck for foie gras, bred for 102 days as a minimum and fattened wih whole corn. Moreover, we add the Protected Geographical Indication IGP Landes that certifies the origin of our ducks. Associating the know-how of the ancients, the competence of an experienced local workforce and the permanent investments in the workshop and processing tools, Lafitte garantees the best products. 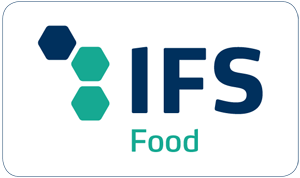 Moreover, by obtaining in 2015 its accreditation IFS at the highest level, the company proves its ability to meet the demands of its customers by mobilizing all its services. Very few firms dedicated in Foie Gras as Lafitte are able to guarantee a full control of their production from duck selection and breeding to process and selling. Deploying the scope of its own specifications for its processed products, Lafitte checks all levels of the production channel and certifies its raw and elaborated products for food security. As our ducks are fed traditionally, their foies gras and magrets have a rustic taste and unique texture. Therefore our foies gras need a light seasoning and our ready cooked dishes are made with simple and family like recipes from the Lafitte know-how. Moreover, all our preserved foie gras, pates and cooked dishes in tins are guaranteed additive and preservatives free. As part of the partnership with the association "Le Club des Chefs des Chefs", LAFITTE Foie Gras promotes the french culinary reputation all over the world, showing the treasure of our culinary heritage : Foie Gras. One of the society's primary purposes is to promote major culinary traditions and to protect and to protect the origins of each national cuisine. The Club des Chefs des Chefs also aims to develop friendship and cooperation between its members, who gave similar responsabilities in their respective countries.